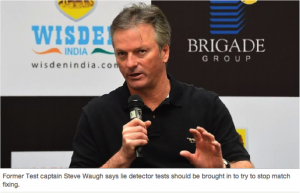 FORMER Australian captain Steve Waugh wants lie detector tests introduced to help solve international cricket’s integrity crisis. Waugh, who retired from Test cricket in 2004, wants polygraphs used to eradicate gambling and match-fixing, which he said were the greatest issues facing the sport. Waugh, 48, has used his place on the Marylebone Cricket Club’s World Cricket Committee to push anti-corruption measures. And he’s even gone to the point of sitting a test to prove its validity. “This is the most serious issue facing the game. We can’t dismiss it this lightly,” Waugh writes in his new book, The Meaning of Luck. “If a player hasn’t done anything wrong, he won’t be afraid. Waugh met polygraph expert and behavioural specialist Steve van Aperen to sit the test. “Maybe it could break open cases, if the lie detector itself or the mere threat of its use led to dishonest players confessing because they sensed a net was closing in on them,” Waugh said. Waugh said he was sick of “cynics second-guessing every dropped catch, poor shot, wide delivery”. He said cricket must act to avoid the confidence crises engulfing other sports, such as cycling. Waugh highlighted the susceptibility of developing Twenty20 tournaments as a potential weak spot. He said there were “opportunities” for corrupt bookmakers, “especially in second-tier tournaments such as domestic T20 competitions and other events away from the prying eyes of global media and more stringent match officials”. But he said it was imperative that cricket acts. “I believe we must explore every avenue available that might help diminish and then end the scourge,” Waugh said.